Devil's food cake is a moist, airy, rich chocolate layer cake. It is considered a counterpart to the white or yellow angel food cake. 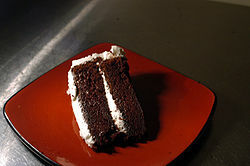 Because of differing recipes and changing ingredient availability over the course of the 20th century, it is difficult to precisely qualify what distinguishes devil's food from the more standard chocolate cake, though it traditionally has more chocolate than a regular chocolate cake, making it darker. The cake is usually paired with a rich chocolate frosting. Devil's food cake is commonly a dense, rich chocolate cake. It traditionally uses unsweetened chocolate baking squares in lieu of unsweetened cocoa powder. However, contemporary recipes typically use cocoa powder for its convenience over the more traditional chocolate baking squares. Also, because of its reduced amount of cocoa butter, cocoa powder has a more intense chocolate flavor than unsweetened chocolate. Moreover, coffee is frequently added as a liquid to enhance the chocolate flavor. Some recipes use hot or boiling water as the cake's main liquid, rather than milk. Its antithetical counterpart, the angel food cake, is a very light white cake that uses stiffly beaten egg whites and no dairy. Devil's food cake is sometimes distinguished from other chocolate cakes by the use of additional baking soda (sodium bicarbonate), which raises the pH level and makes the cake a deeper and darker mahogany color. Devil's food cake incorporates butter (or a substitute), eggs, flour, and less egg than other chocolate cakes. Devil's food cake was invented in the United States in the early twentieth century, with the recipe in print as early as 1905. ^ "Chocolate vs. Cocoa Powder". FineCooking.com. Retrieved 2015-09-29. ^ Sertich Velie, Marissa. "Can I Substitute Unsweetened Chocolate for Cocoa Powder?". SeriousEats.com. Retrieved 2015-09-29. ^ a b c Samuel A. Matz (1 January 1992). Bakery Technology and Engineering. Springer. pp. 344–345. ISBN 978-0-442-30855-1. Retrieved 15 April 2012. ^ Judith M. Fertig (13 September 2003). All-American Desserts: 400 Star-Spangled, Razzle-Dazzle Recipes for America's Best Loved Desserts. Harvard Common Press. pp. 144–. ISBN 978-1-55832-191-5. Retrieved 15 April 2012.